Debra Lee Baldwin specializes in showing how top floral and garden designers use dynamic, sculptural succulents in a wide variety of eye-catching applications. Her own garden, which has been in Sunset and Better Homes & Gardens, is in the foothills northeast of San Diego, where temps range from below freezing to upwards of 100 degrees. Debra, a garden photojournalist, got her start writing about homes, gardens, architecture and interior design for the San Diego Union-Tribune, then went on to scout, write and shoot for major magazines. 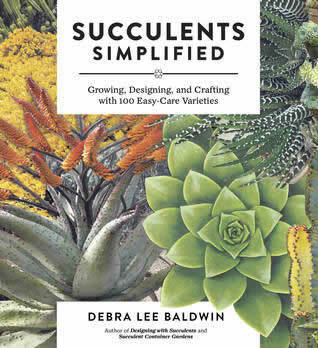 In 2005, her editor at Sunset suggested she do a book on succulents. “That changed my life,” Debra says.